GeoPot, a Santa Rosa based company that specializes in fabric plant pots, recently added a rich new color option to their GeoPot product line, just in time for the spring planting season! A local Bay Area hydroponics supplies company, GeoPot, now features its GeoPot product line in a new and exciting color option: Tan. This latest color option gives gardeners more choices when designing their personal landscape. GeoPot understands how important color palettes are to the interiors of a home, and now gardeners have the opportunity to bring more choices to the outdoors! The combination of the tan GeoPot and the black GeoPot can create endless possibilities for a unique color palette that can bring unity to the design and overall look of the garden. The black color option provides a versatile backdrop, drawing the eye to the dramatic contrast of garden plants, while the new tan option softly melds into the natural landscape, which enhances cool plant colors, such as blue, green or purple, as these colors work in harmony with one another. GeoPot is a self-supporting breathable fabric plant pot that air prunes a plant’s roots when they reach the edge of the container. This air root pruning process forces the roots to branch out with more fibrous feeder roots, which are more efficient in taking up water and nutrients. The porous fabric also allows air into the root zone, providing for great drainage and creating a healthy environment for the roots. With the combination of air root pruning, creating a better root structure and the aeration of the root zone, the plant can reach its full potential. Bay Area planter boxes company, GeoPot will be participating in the Sonoma County Home & Garden Show from March 18 through March 20 at the Sonoma County Fairgrounds in Santa Rosa. Please stop by and visit the GeoPot booth for more information on the benefit and convenience of the GeoPot product line. 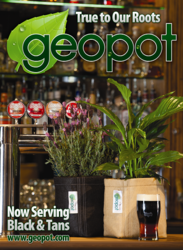 To purchase GeoPot products, visit their website for a list of their retail stores locations in the Bay Area. GeoPot can also be purchased through their convenient online store. Online orders via their website receive 10-percent off. Offer is valid from March 1 through June 1. Enter “spring2012” code into the coupon area during check out. Always remember, GeoPot keep gardeners “true to their roots” by helping them grow strong, vigorous plants – even in harsh climates. For more information about any of GeoPot’s products, call 1-855-214-1835 or visit the company on the web at http://www.geoplanter.com. Dennis Hunter and his family and friends are avid gardeners. With twenty years of hands-in-the-soil gardening experiences, Hunter developed the self-supporting GeoPot and PVC-framed GeoPlanter to make gardening easier and more fulfilling. Both the self-supporting GeoPot and the PVC-framed GeoPlanter, a planter box, allow for the optimization of root zone dynamics and versatility. They can even be machine-washed and reused.